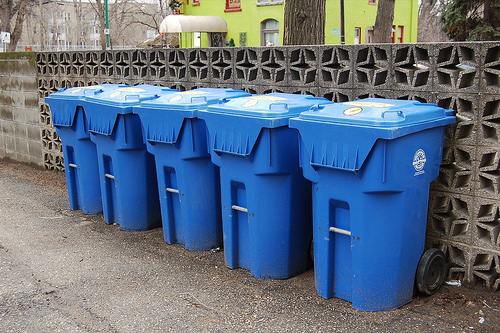 Home Costs > How Much Does a Recycling Bin Cost? How Much Does a Recycling Bin Cost? A recycling bin is a type of container used to store or hold recyclable materials and waste. These bins are taken to recycling centers where the items are processed to become usable once again. Recycling bins come in different sizes and can be color coded to identify the contents of the bin without having to open it. The bins look like an ordinary trash can but have the recycle symbol that sets them apart from ordinary trash bins. The price for these bins depends on the size of the container and where you purchase it. On average, a recycling bin can cost anywhere from $10 to $170; however, your local city or garbage service may offer your one for free. For example, in Mesa, Arizona, they will provide its citizens with a recycling bin at no charge. For example, the popular Rubbermaid FG571873 18-gallon bin retails for $30 to $60, while this nine star can with an auto motion sensor lid retails for $80 to $120. The Simple Human recycling bin, another popular bin designed for home use, can cost $70 to $160, depending on the size. If you live in an apartment or condo, ask your local city department about areas where you can recycle items. Many cities will have local recycling centers where you can drop off items for free. See how many items you plan on recycling. This way, you will be able to identify the size of the recycling bin that you will purchase depending on the number of recyclables you are throwing out. Check with your local garbage company or city to see if they can offer a recycling bin for either free or at a steep discount. Check local city recycling programs. There are some towns that offer incentives to those that recycle. They will offer points that can be used through various local retailers. Consider a public recycling bin instead of using a service to save on monthly bills.